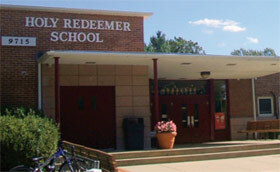 System & Presents Opportunity to Add Special Security Features When a powerful storm swept through metropolitan Washington, D.C. early last summer, an electrical strike knocked out the entire communications system at Holy Redeemer School in nearby Kensington, MD, leaving the Catholic school without telephone service. About the only good thing about the incident was that the K-8 students were on summer break and not due to return for a couple of months. Still, the school had to make a series of quick decisions about how to restore phone service.